The establishment of landscape as a discipline within the study of cultural-archaeological heritage in Palestine was consolidated when the Palestinian Institution for Cultural Landscape Study was established as non-governmental institution. 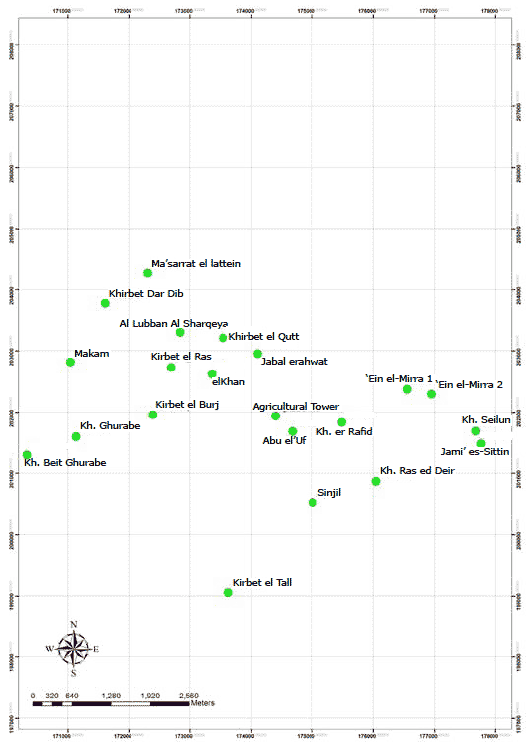 This began with landscape surveys of the villages of Jabba’ in 2000 (Barghouth, 2007: 90), and ‘Ain ‘Arik in 2007 (Barghouth and Mahmoud Nasir 2008, 41-43) by Al-Mashhad, these surveys followed multi-disciplinary approaches to investigate the local level in the modernization process in Palestine, which has been operating from the late Ottoman period until the present time, with changes taking place on the macro and micro levels in the landscapes of traditional villages. 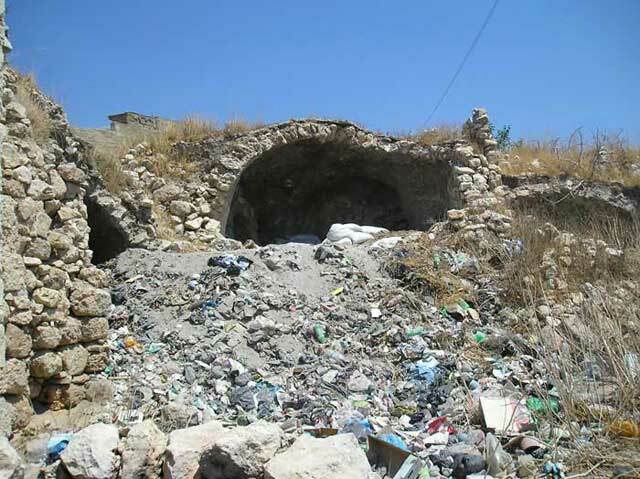 This paper presents the results of a preliminary survey to address the destruction processes in the cultural-archaeological landscapes of three Palestinian villages in the West Bank: Shuqbah (Wadi el-Natuf), Sinjil and Al-Lubban Al-Sharqeya. These three villages were selected due to the great degree of cultural diversity within their surrounding landscapes, which contain ancient roads, land use, limekilns, springs, cisterns, caves, archaeological sites, and boundaries of the traditional settlements. The aim is to complete an inventory of the destruction of these cultural-archaeological landscapes on a micro scale, in order to be able to deal with the destruction factors on a macro scale. The framework for addressing the destruction of the cultural-archaeological landscape will focus on three issues: (1) the effect of socio-economical changes on the landscapes of these villages. (2) Environmental effects. (3) The effects of geopolitical changes on the landscape. Within this context we will focus on the Oslo Accords agreement, the political division of cultural-archaeological landscapes in West Bank, and the reason that these three villages are located in the so-called ‘C’ areas as Oslo Convention states. إن القوام التأسيسي للمشهد الحضاري من جهة كونه نظاماً متآلفاً، يدرس التراث الحضاري- الأثري في فلسطين ، قد تبلور عندما تم تأسيس المؤسسة الفلسطينية لدراسة المشهد الحضاري كمؤسسة غير حكومية. بدأ هذا التأسيس مع المسح الأثري الذي تم في قرية جبع عام 2000 (برغوثي 2007). وفي عام 2007 أجري مسح أثري آخر للمشهد الحضاري ، في قرية عين عريك (سمير، داود ، جمال ، محمود 2008). هذه الورقة عبارة عن مسح تمهيدي وأولي لمعالجة عمليات التدمير للمشهد الحضاري – الأثري لثلاث قرى فلسطينية في الضفة الغربية ،هذا المسح التمهيدي والأولي لعمليات التدمير سيكون تتويجاً ممنهجاً ، نحو دراسة المشهد الحضاري- الأثري لهذه القرى. من خلال هذه الورقة سنحاول أن نسلط الضوء على سياسات التدمير للمشهد الحضاري –الأثري لقرى : شقبة (وادي الناطوف)، سنجل ، واللبن الشرقية. في الواقع إن اختيار هذه القرى الثلاث، يعود إلى تراكم المشهد الحضاري والثقافي وتنوعه ضمن حدود هذه القرى، والتي تحوي طرقاً قديمة، وأراضي مستخدمة، وأفراناً قديمة لحرق الجير، وعيون ماء، وأحواضاً وصهاريج، وكهوفاً، ومواقع أثرية، وحدود المستقرات والقرى التقليدية. إن الهدف الرئيسي من العمل يكمن في محاولة مسح جردي لعملية تدمير المشهد الحضاري – الأثري، عن طريق مسح عوامل التدمير في النطاق الضيق للمعالم والمواقع، بغية التعامل مع عوامل التدمير المؤثرة في نطاق المسح الحضاري ككل. إن البنية الأساسية والإطار الهيكلي لمعالجة عملية تدمير المشهد الحضاري سترتكز على ثلاث قضايا رئيسية: 1- أثر التغييرات الاجتماعية الاقتصادية على المشهد الحضاري لهذه القرى . 2- الأثر البيئي. 3- أثر التغييرات الجيوسياسية على المشهد الحضاري . وفي هذا الإطار سيتم التركيز على اتفاقية أوسلو، وعلى التقسيم السياسي للمشهد الحضاري في الضفة الغربية. والسبب في ذلك ناجم عن كون هذه القرى الثلاث تقع في ما يسمى المنطقة (c) حسب اتفاقية أوسلو الدولية. مازن عويس ، شفيق شبانة ،وليد ريماوي. المؤسسة الفلسطينية لدراسة المشهد الحضاري. Landscape studies is not an academic discipline in Palestinian institutions or universities, where both theory and praxis of the subject are studied at a very basic level only. Few studies have dealt with landscape as a term or as discipline, with the main studies about the landscape in Palestine from Edward Said and Abu Lughod (Said, 1999; Abu Lughod et al., 1999), while other literature is still relatively undeveloped in this area. Studies detailing the destruction of the landscape in Palestine have instead been produced in response to Israeli policies against Palestinian people or against the landscape, under the framework of postwar recovery for cultural heritage (Amiry and Bshara, 2007), especially during the last intifada in 2000 following the Israeli invasion of the major towns of the West Bank, or to criticize Israeli archaeological activities in the West Bank since 1967 until the present time (Greenberg and Keinan, 2009). The occupied are thus still subordinated by the occupier in producing knowledge and their discourse, which can best be described as hybrid. Archaeology in Palestine still either revolves around and mimics classical archaeology models, or is under the hegemony of neo-liberalism. Furthermore landscape is subject to damage due to a range of different factors and powers, whereby it is no exaggeration to say that hundreds of archaeological and cultural sites and monuments are threatened with destruction as a result of various policies. Louder voices from time to time have called for protection of the cultural landscape in Palestine, but until today policies for the protection of the landscape and cultural heritage have not yet risen to the national level. In this paper we will try to shed light on the processes of destruction of the cultural landscape in Palestine by focusing on a number of archaeological sites and the cultural landscape of three villages: Shuqbah (Wadi el-Natuf), Sinjil and Al-Lubban Al-Sharqeya. These three villages were chosen due to the high degree of cultural diversity within their boundaries, including ancient roads, agricultural land use, limekilns, springs, cisterns, caves, archaeological sites, and boundaries of the traditional settlements. In the following, cultural landscape destruction will be analysed using a framework based on three issues: the effect of socio-economical changes on the landscape of these villages, environmental effects, and the impact of geopolitical changes on the landscape. We will focus on the Oslo agreement, the political division of cultural landscape in West Bank, and the reason that these three villages are located in the so-called C areas as Oslo Convention states. The Oslo “peace” process was a major milestone in creating a dramatic change in the reality of the landscape in Palestine. The Oslo process divided the land into three areas A, B and C. In area A (only 11.7% of the west bank), Palestinians have both administrative and security control over the land, in area B (26.3%) they Have administrative responsibility only, while area C (62%) is under full Israeli control (which includes cultural-archaeological sites and landscapes). Consequently, the West Bank including East Jerusalem has been divided into more than sixty disconnected cantons crisscrossed by a network of bypass roads and Israeli settlements (Muhawi, 2007: 63). Shuqbah was selected mainly because the landscape of the village belongs to the Natufian culture, which is considered to be universal heritage, while archaeological surveys have shown continuity across different periods. 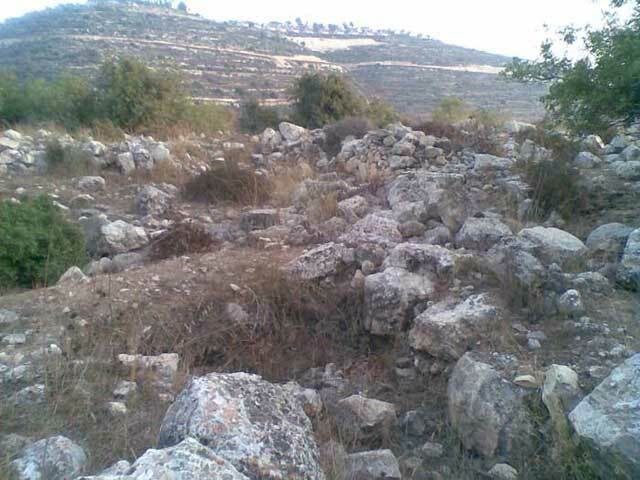 The destruction of the Shuqbah landscape is rapid, with most of the archaeological monuments suffering damaged by the Israelis as the village is located in area C according to the Oslo Accords, which means that the Palestinian National Authority has no administrative or security control over either the village or the cultural landscape, while socio-economic and environmental changes are also a factor. Shuqbah is a Palestinian village in the Ramallah and al-Bireh Governorate, located 25 kilometers northwest of the city of Ramallah. It is bounded from the southwest by the village of Qibya, from the southeast by Shebtin, from the northeast by Deir Abu Mish’al and from the north by the Israeli settlement of Ofarim. With a total area of 13,990 dunams (1,399 ha) and a built-up area covering 616 dunams (61.6 ha). Shuqba had a population of 530 in 1922, which had risen to 4,497 by 2007. Palestinian society has undergone numerous socio-economical changes since the Israeli occupation of the West Bank and Gaza in 1967. One of main factors affecting the landscape is the expansion of new built up areas at the core of the traditional settlements. The traditional settlement of Shuqbah was built on more strata from earlier periods, with our survey finding scatters of pottery dated to the Crusader, Ayyubed and Mamluk, and early and late Ottoman periods. Evidence has also been uncovered by excavations in and around the center of the old town, with structures including wells and channels from the early Ottoman period being found by chance during work by the municipality near the mosque.. However, these structures were quickly re-filled again without any documentation. It was also reported that there had not been any involvement by the Antiquities Department during this or any other works in the region, nor has there been any preservation work to maintain the landscape and cultural heritage of the area, with traditional houses in Shuqbah for example continuing to being used for dumping trash, and adversely affected by rain and humidity. The landscape of the built-up area and the border of the village are constrained by the Israelis, with the spread of the village limited by the separation wall along the western side of the village, by the Israeli settlement of Ofarim in the north, and by an Israeli bypass road to the south. The landscape of Shuqabh, containing archaeological sites, olive groves, landmarks and springs is being devastated without any kind of inventory or documentation. Table 1: Cultural-Archaeological Landscape of Shuqbah. Fig. 2: Destruction of traditional architecture in Shuqbah. 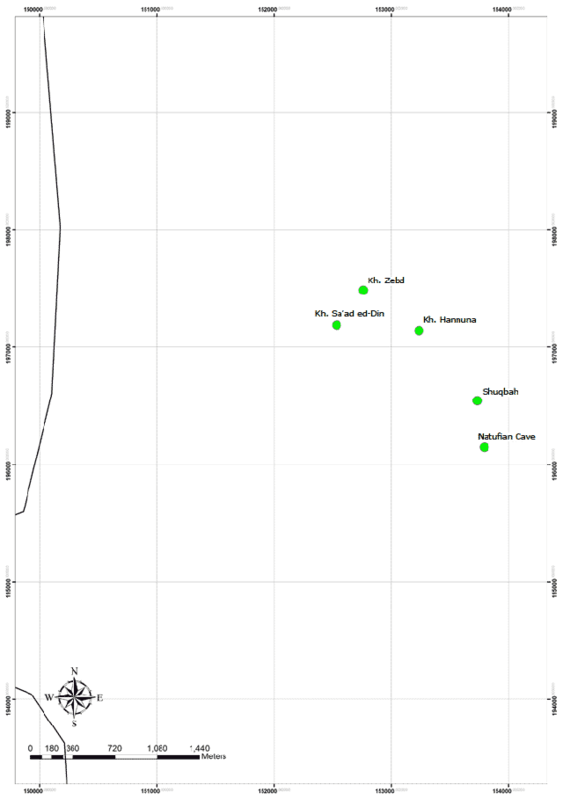 The emergence of the Natufian culture around 13,000 or 12,800 BC was a major turning point in the history of the Near East (Bar-Yosef, 1998: 163). The site of Wadi el-Natuf was mentioned by Conder in his Survey of Western Palestine as a small village on high ground surrounded with trees (Conder, 1889: 289). The site was also surveyed in September 1924 by father Alexis Mallon of the University of St. Joseph on a journey from Jemmala to Lydda (Boyd, 1999: 210). In 1928 Garrod conducted excavations at the site for two seasons, circumstances that lead to the unintended cancellation of the planned Shuqbah project (Ibid. : 212), which has subsequently never been professionally excavated. Wadi el-Natuf is facing a systematic destruction process. The cave has now been surrounded by the expansion of the built-up area on the south-eastern and north-eastern sides of the village. It is also between Israeli bypass roads that cross the mountains from the southwest to the northeast side of the village, The Israelis have started a project to widen one of the roads, which will have an effect on the landscape of the cave. Incursions on the south-western side of the cave are destroying its cultural landscape and that of the village, while to the northeast of the cave there is an enormous scrap heap for cars. In addition to all this there are no organized visits to the cave, which anyone can enter the at anytime and use as they choose to, as evidenced by the empty cans and remnants of food both inside and around the entrance. Sinjil is located on the main road from Jerusalem to Nablus, 21 km north of Ramallah, the name originating with St. Gilles the priest during the Crusader period. The French Count Raymond VI of Toulouse built a castle in Sinjil to protect caravansaries on the road from Damascus to Jerusalem. Sinjil is surrounded by Turmus ‘Aya to the east, al-Lubban al-Sharqeya to the north, Jiljilia to the west, with the Israeli settlements of Shiloh to the northeast and Ma’al Lebonah to the north. The landscape and cultural heritage of Sinjil is magnificent, containing a range of archaeological sites, traditional settlements, ancient roads, agricultural land use, limekilns, springs, cisterns, agricultural towers, and caves. The Israelization process, a term that describes Israeli activities in the West Bank between 1967 until the present time, has involved the construction settlements according to biblical narratives and archaeology, with bypass roads and militant policies such as checkpoints and the separation wall (Barghouth, 2007: 92). Israelization of the landscape of Sinjil started during the Israeli occupation of the West Bank in 1967, with the building of the Shiloh and Ma’ali Lebonah settlements, based on biblical references and archaeology, and of a bypass road to the eastern side of the village. This has also involve Israeli control of archaeological sites around and inside Shiloh, including a Middle Bronze Age site, a Byzantine church with a mosaic floor, and a small Umayyad mosque (Finkelstine, 1997: 635). Table 2: Israelization of the landscape of Sinjil. 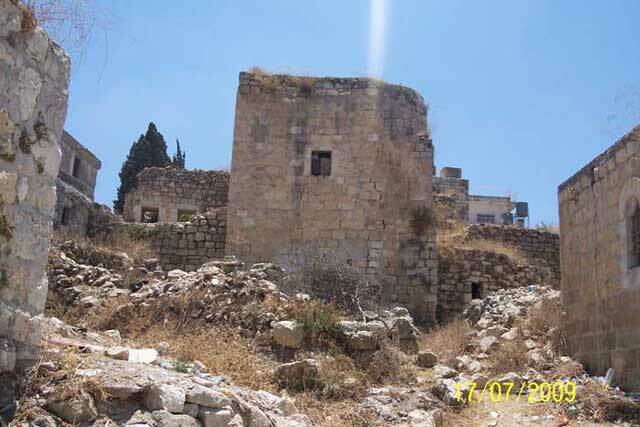 The second problem in Sinjil is the expansion of the built-up area at the core of the traditional settlement, which was built on the remains of earlier periods, mainly the Crusader, Mamluk, early and late Ottoman. This area is now facing cultural destruction, firstly by damage to and neglect of traditional structures from the Ottoman period, and secondly by the digging of foundations and sewers, and through road construction. Table 3: Cultural-Archaeological Landscape of Sinjil. Al-Lubban al-Sharqeya is located north of Sinjil, on the main road from Nablus to Jerusalem. The importance of al-Lubban came from the Mamluk khan, a caravanserai that once protected travellers on the main road from Damascus to Jerusalem (Hawari, 2001: 7-8). Al-Lubban has been occupied from the period IA I-II until the present time, and there are many khirabs (three main ones in addition to Makam) and monuments around the village, as well as three springs. Lubban is a village perched on a terrace on the hill, with badly-built houses half in ruins, and rock-cut tombs to the south-west, which are little more than rude caves. There are five pillar shafts still standing near the little mosque, and one doorway has medallion designs on the arch, which appears to be Arab work. The white colour of the cliff accounts for its name of “milk-white”. The village has an appearance of great antiquity, though the water supply is at some distance, at the fine springs in the ruins of khan Lubban. The place is recognized as the ancient Lebonah (Judges xxi, 19), and is probably the Beth Laban of the Talmud, from which wine was brought to Jerusalem (Mishnah Menachoth ix. 7). Marino Sanuto mentions it as Casale Lepna (Conder, 1889: 286). The landscape and archaeological sites inside and around the village have been exposed to destructive processes including socio-economical change and Israeli policies in the entire region between Sinjil and al-Lubban, which they considered to be a biblical and sacred landscape. Like many villages in the West Bank, al-Lubban has undergone a range of social and economical changes, These have had a serious impact on the traditional architecture, which mainly belongs to the Ottoman period, and for various reasons has mostly been abandoned. It is very difficult to find a traditional structure that is still standing and in good architectural shape today, because most of structures have been destroyed and replaced by new houses. To the northern side of the village many of the tombs and caves have been used as sewers, and all of the archaeological sites around the village have been damaged in one way or another, including looting. Table 4: Cultural-Archaeological Landscape of Al-Lubban Al-Sharqeya. We conclude that the destruction of the cultural-archaeological landscape in Palestine is a combination of different issues, principally modernization (socio-economical changes), the geopolitical situation including the Israelization process, and environmental factors. The cultural-archaeological landscapes of these villages contain more than 29 sites, in addition to olive groves, roads, and the locally-named elements of the landscape, like mountains and valleys, with a historical distribution of land ownership . The focus of protection and preservation policies in Palestine must shift from single monuments, sites, and features to the entire cultural landscape. We believe that these policies can only be applied if landscape studies are recognised as a distinct discipline and approach. In addition, laws protecting the landscape should be enacted, and applied by working side by side with local communities. We would like to thank Jamal Barghouth for his directions and interpretations about landscape in general and about the landscape of Palestine in particular. In addition to that Mazen is grateful to Waleed and Shafeeq for their thoughts, and their work in the field. Abu Lughod, I, R Heacock and K Nashef (eds.) 1999 The landscape of Palestine: equivocal poetry. Birzeit: Birzeit University Publications. Amiry, S and K Bshara 2007 Political Conflict and Recovery of Cultural Heritage in Palestine. In N Stanley-Price (ed.) Cultural Heritage in Postwar Recovery. Rome: ICCROM, pp. 68-74. 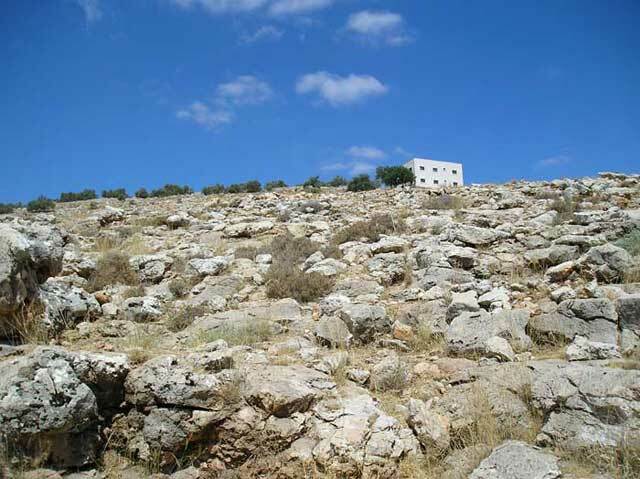 Barghouth, J and M Nasir 2008 “For a Comprehensive approach to and an agenda to protection: (Promotion) and preservation in Palestine for cultural landscapes, case study - ‘Ain ‘Arik Village.” Paper presented at REHABIMED conference, Barcelona. Bar-Yosef, O 1998 The Natufian Culture in the Levant, Threshold to the Origins of Agriculture. Evolutionary Anthropology, 6:159-177, doi:10.1002/(SICI)1520-6505(1998)6:5<159::AID-EVAN4>3.0.CO;2-7. Boyd, B 1999 Twisting the Kaleidoscope-Dorothy Garrod and the Natufian Culture. In W Davies and R Charles (eds.) Dorothy Garrod and the Progress of the Paleolithic-Studies in the Prehistoric Archaeology of the Near East and Europe. Oxford: Oxbow Books. Conder, C R and C Warren 1889 Survey of western Palestine. London: Palestine Exploration Fund. Finkelstine, I (ed.) 1997 Highlands of Many Cultures: The Southern Samaria Survey – The Sites I. Tel Aviv University: Institute of Archaeology Monograph Series. A Sourcebook. Tel Aviv University Press. Muhawi, F 2007 “A Landscape of Surveillance and Control.” Paper presented at the international conference: Conservation and Management of Landscape in Conflict Regions. Birzeit University.